The painting above was created by Georgi Yordanov Bozhilov, whose nickname was Slona- The Elephant. He painted it in 1959. It seems likely that he had witnessed the events of the Plovdiv tobacco workers strike years earlier in 1953. To get past the censors he made out that it referred to an earlier tobacco workers strike in late 1939-1940 in an example of “coding” used by so many Eastern European artists, writers and musicians, including Shostakovich, under the iron heel of Stalinism. In any case, because of the extreme censorship carried out by the Bulgarian regime, the Plovdiv strike and ensuing massacre was known to very few, and the adjudicating artistic jury passed it for exhibition. Indeed later in the year it was exhibited at the First International Biennial of Young Artists in Paris. Stalin died on March 5th, 1953. In April the tobacco workers in Plovdiv, the second largest town in Bulgaria, began to organise around their grievances, in an unheard of display of bravery. The tobacco industry had been nationalised under the Stalinist regime in 1947. Conditions had deteriorated, with workers, who were mostly women, losing their permanent jobs and being placed on seasonal short term jobs, with no social benefits during their times of unemployment. In addition they lost the bonuses they had received in pre-nationalisation days and the holiday accommodation provided by the tobacco industry was taken away. The atmosphere in the tobacco industry was increasingly repressive with workers bullied and treated harshly. In early April tobacco workers met and demanded that they receive year-round employment, a five day working week and the restoration of other former benefits, including their bonuses. On April 20th they sent a written request to the Prime Minister Valko Chervenkov. It said that they would leave work at the beginning of May and protest at the Secretariat of the State Tobacco Monopoly in Plovdiv. That evening they elected a strike committee. This was followed by meetings in tobacco warehouses in Plovdiv. On May 4th a large delegation of Communist Party high-ups arrived in Plovdiv. They included the Minister of the Interior Georgi Tsankov, the Minister for Industry, Anton Yugov, representatives of the Council of Ministers including Raiko Damyanov, Stanko Todorov, and Georgi Chankov, chief of the State Planning Commission. They were accompanied by the mayor of Plovdiv, Nikola Balkandzhiev and the secretary of the local committee of the Communist Party, Ivan Prumov. Jugov had been specifically sent to Plovdiv because he himself had been a tobacco worker and had been active in the big strike of tobacco workers in 1940. The Communist apparatchiks were panicked by the first strike in a satellite state of the Soviet Union. The most active strikers were the stokers in the warehouses and the workers in the Tomasian factory. On May 3rd the night shift workers at the Ivan Karadjov warehouse had driven out the guards and barricaded themselves in. The following morning the militia arrived and surrounded the warehouse. As a result the women workers at the Stefan Kiradjev and Georgi Ivanov warehouses went out on strike. They made their way to the Ivan Karadzhov warehouse and confronted the militia. These fired in the air several times and then retreated. 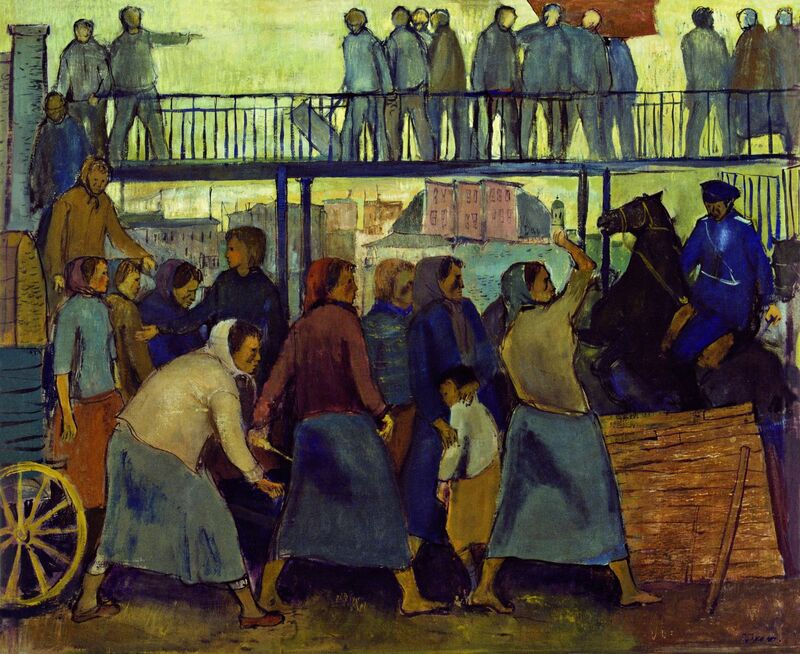 The strikers from the three workplaces then rallied in the courtyard of the Ivan Karazhov. They were joined by other tobacco workers. Speakers from the strike committee addressed them as well as the anarchist Stanio Vatev, a long-time tribune for the tobacco workers, who had been active in the resistance against the previous regime. He assured them that their cause was just and that they should march to the Monopoly Secretariat. Other workers began to gather outside the Tomasian factory, some eyewitnesses talking of hundreds, others of thousands. The Communist delegation arrived at this point. Yugov was the first to speak. Mounting the rostrum in the courtyard, he had only just spoken the word “Comrades” when stones began flying in his direction. The militia began to fire in the air. Stanko Todorov then mounted the rostrum and was similarly met with a hail of stones. The local Party chief Prumov then ordered the militia to fire on the strikers. As a result at least three strikers were killed, fifty injured and hundreds arrested. However other accounts talk of much higher casualties. One researcher found the names of nine strikers killed, whilst others spoke of much higher numbers. The anarchist Stanio Vatev was shot by a militiaman firing from the second floor of the warehouse (allegedly the killer was a grandfather of one of the recent mayors of Plovdiv). Stamka, a member of the strike committee, was killed in the first volley. Another striker, Kiril Dzhavizov was shot at the station. He was buried in a sealed coffin and his relatives were told that he had been killed by the strikers! Another striker Vera Vuleva was run over by a militia truck and died later at the county hospital. So ended the first revolt against Soviet power in Eastern Europe after the death of Stalin. One month later the East German workers rose in revolt, to be followed by the Hungarian Revolution of 1956. Two strikers, Dimitar Baharov and Zlatka Vlaycheva managed to escape from Bulgaria and worked for Goryanin Radio, “The Voice of the Bulgarian Resistance” from Athens until 1962. The killers of Stanio Vatev were acquitted by the Plovdiv District Court. In the aftermath the Communist leadership looked around for scapegoats, sentencing Stoycho Moshanov and Metodi Yanchulev, leaders of the Democratic Party, to sentences of 12 years and 15 years respectively for trumped up charges of organising and supporting the strike. As for the strikers many were sent to the labour camps at Belene, Stara Zagora, Skravena, Sliven and Ognyanovo. Prumov, who had commanded the militia to fire, was rewarded by being promoted to be Minister of Agriculture. The mayor Balkandzhiev received the Order of Civil Honour, whilst the head of the Plovdiv militia was elected as head of the Tobacco Monopoly. As for Yugov and Damyanov, they were punished for lack of zeal in the confrontation with the strikers and were expelled from the Party. Years later, on November 10th 1989, the son of Kiril Dzhavizov demanded the exhumation of his father’s body to prove that he had been shot by the militia. A dozen eyewitnesses were ready to testify but doctors from the Plovdiv Forensic Medicine told him that the exhumation would be worthless after such a long time. In disgust Dzhavizov emigrated to Canada with his entire family in 1992.